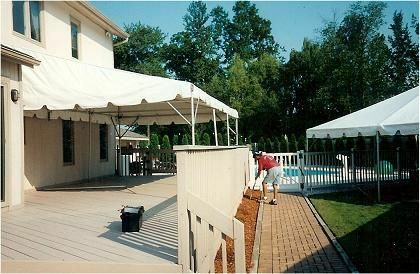 Our 14' wide awning style deck tent is great for when you want to have protection from the rain and shade from the sun on your patio or deck. When it gets colder you can add sides & heat to make an additional room on your house. The base size is 14' x 15' and it can expand in 7 1/2 ft intervals all the way up to 14' x 45'.